The All Progressives Congress (APC) Gubernatorial candidate in the 2019 general elections in Oyo State, Mr. Adebayo Adelabu has declared that his friends and admirers thought that he was mentally derailed when he resigned as Deputy Governor of the Central Bank of Nigeria (CBN) to join the gubernatorial race in the state. Mr Adelabu said although he was considered mad by many people after they learnt that he had resigned from CBN, his determination to serve the people of the state and his love for the state made him to resign from CBN. The meeting which was called at the instance of the Jericho Businessmen Club Ibadan. The oil and gas stakeholders were led to the meeting by National President of the Petroleum Tanker Drivers (PTD), Otunba Salmon Oladiti. He said, "People thought that I was mad when I resigned as the Deputy Governor of CBN. My determination to serve my people made me to resign, my love for Oyo state and the masses made me to resign. I love Oyo state, and my intention is to get closer to my people". "If I am after money, I should not have resigned my appointment as the Deputy Governor of CBN. My mission is the renewal of my family's good name. I have benefitted a lot from my grandfather's good name. I must also leave a good name for my own children and grandchildren". 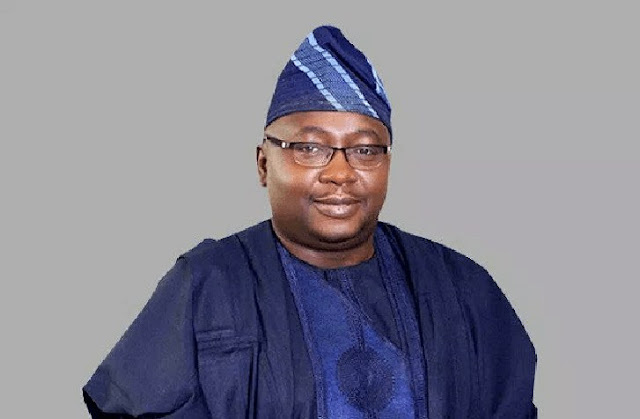 Adelabu maintained further that his love for Ibadan and Oyo state made him to resign as the Deputy Governor of CBN to join the 2019 governorship race in the state on the platform of the ruling APC, promising to remove status of discrimination among the citizens if elected. He added that, "I never spent a weekend in Abuja throughout the period of four years and three months I spent as the Deputy Governor of CBN. There are 52 weekends in a year, and about 208 in four years. I always came to spend my weekends in Ibadan because of the passion that I have for my state." Oladiti while speaking revealed that the oil and gas stakeholders decided to support Adelabu for him to build on the good foundation already laid by incumbent Governor Abiola Ajimobi of the state, saying that the association always support politicians who have the love of masses at heart. According to him, "successive administrations in Lagos state have continued to build on the solid foundation laid by former Governor Bola Ahmed Tinubu. "Governor Ajimobi has laid a good and solid foundation for the socioeconomic and political development of Oyo state. Oyo state deserves continuity like Lagos state. We need a governor who will build on the foundation laid by Ajimobi. "We should not go back to Egypt, and that is the reason why we have decided to support Adelabu Penkelemesi. We are doing this because of the faith we have in his ability and credibility. He had served in both private and public sectors of the banking industry. He used his position of the Deputy Governor of the Central Bank of Nigeria to bring development to Oyo state".